With growing trends of urbanization and people spending more of their time indoors, the quality of indoor air is an important health consideration. Homes in cold climates reduce airflow as windows close and most apartment builds offer little ventilation. The increased use of synthetic materials over natural fibers and minerals, along with chemicals used in building materials have brought increased volatile organic compounds (VOCs) into the home and work place. These air born VOCs range from carcinogens like formaldehyde to petrochemicals like benzene and xylene. This is added to more familiar household chemicals such as alcohols and ammonia. Obvious sources like paints and adhesives combine with subtle sources like grocery bags, cosmetics, paper towels, and upholstery. All emit this wide range of chemicals into our indoor spaces and the air we breath. As building practices better seal buildings from outdoor air, we are also creating the problem of trapping these air born chemicals indoors. When The National Aeronautics and Space Administration (NASA) began researching how to maintain a healthy indoor environment for astronauts traveling to the moon (which is an excellent extreme example of our indoor air problems, they needed to address high amounts of chemical emissions and with no possibility of outdoor air exchange) they quickly realized that the best air and water filters were not products of their own engineering, but from nature: plants. A series of studies conducted by NASA and Wolverton Environmental Services, Inc. assessed the air-cleaning properties of a wide range of common indoor plants, identifying their varying capacities for chemical removal. Subsequent studies have also found microorganisms in the potting substrate important contributors to emission absorption. The collection of plants that have been identified as air-cleaning species can grow in a large range of indoor environments. Furthermore, their use is not limited to air cleaning potential; for all of these plants can contribute additional functions to our indoor spaces whether it be ornamental, medicinal, or edible. Taking into consideration the unique micro-climates and need of your home, you can build your own efficient air filtration system with a polyculture of air cleaning plants. 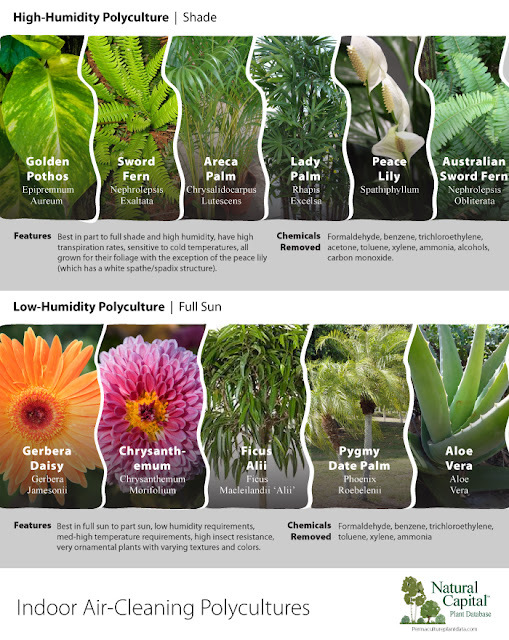 The Natural Capital Pant Database has documented these plants to help subscribers build their own air cleaning polycultures for indoor use. Features: Best in part to full shade and high humidity, have high transpiration rates, sensitive to cold temperatures, all grown for their foliage with the exception of the peace lily (which has a white spathe/spadix structure). Chemicals removed: Formaldehyde, benzene, trichloroethylene, acetone, toluene, xylene, ammonia, alcohols, carbon monoxide. Features: Best in full sun to part sun, low humidity requirements, med-high temperature requirements, high insect resistance, very ornamental plants with varying textures and colors.